Despite posting great financials for the quarter and the year, Activision's share value dropped more than six percent on news that World of Warcraft subscriptions continue to decline. Behold Activision, which is having a pretty good year. In its most recent financial statement, the company reported third-quarter earnings of $148 million, nearly tripling the outlook it provided in early August. Quarterly profits outpaced analysts' expectations, leading Activision to raise its year-end forecast. On top of all that, Modern Warfare 3 was every bit as big as expected and may ring up 18 million unit sales by the end of the year. Yet Activision's share price tumbled 6.5 percent on the news. 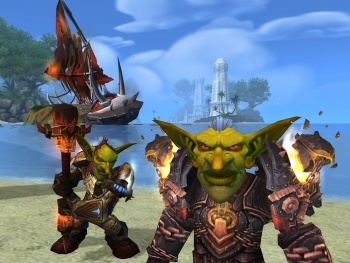 The problem, according to Citigroup analysts Neil Doshi and Mark Mahaney, is World of Warcraft, which lost 800,000 subscribers over the quarter. That's problematic because subscription income from games like World of Warcraft - and let's be honest, the only game like World of Warcraft is World of Warcraft - represents 44 percent of Activision's business, the largest single slice of the pie. And although it's still the big dog in the subscription-based MMO pack with 10.3 million users, nothing, not even WoW, can take a hit like that and not feel it. It's even worse if you look back over the past year: from October 2010 until now, the game has dropped nearly two million subscribers. Those losses could grow even worse over the holiday quarter, they said, thanks to competition from big releases like Skyrim and, you guessed it, Modern Warfare 3.